Since 16 August 2015, there has been 56 officially confirmed, open-ended and round-the-clock curfews in 17 districts of 7 cities (primarily Diyarbakır, Şırnak, Mardin and Hakkâri) that approximately 1,299,061 people resides (2014 population census). During these officialy declared curfews, fundemental rights of people such as Right to Life and Right to Health is violated and 124 civilians lost their lives according to the data of HRFT Documentation Center. 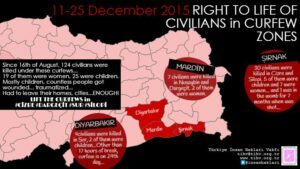 The curfews declared on 11 December 2015 in Sur District of Diyarbakır (again, after 17 hours of break), Dargeçit District of Mardin and on 14 December 2015 Cizre and Silopi Districts of Şırnak and again Nusaybin District of Mardin are still going on and in these 2 weeks 41 civilians were killed (7 of them are children, 1 of them is death in the womb through gun shot and 8 of them are women) and 41 civilians (14 children, 8 women) got wounded. Moreover, at least 15 of these people were killed while they were within the boundaries of their homes, due to opened fire or hitting by a missile. STOP KILLING PEOPLE! There are no other things that Human Rights Foundation of Turkey can give voice to. Everyone should only strongly shout this out! You can download and check the detailed table for further information between the dates 16 August – 31 December 2015. In Sur District of Diyarbakır (central district of Diyarbakır where 121,75 people resides according to 2014 population census) curfews were declared for 5 times before and longest of these continued for 9 days, 6 civilians (2 of them are children). lost their lives. The 5th curfew was declared on 2 December 2015 at 5 am, continued for 9 days, and was lifted on 10 December 2015 at 11 pm. After only 17 hours of break, curfew was declared again on 11 December 2015 at 4pm for the 6th time and that one is still going on today. On December 14, 2015 Ayşe Aytekin (69) was wounded due to clashes by a shot in her leg. On December 14, 2015 people gathered in Koşuyolu Park in Bağlar District of Diyarbakır (again city center, the district next to Sur) to protest the curfew. Şerdıl Cengiz (21) and Şiyar Salman (18) was shot to death by the random fire of police against citizens. On December 16, 2015 security forces blockaded Kaynartepe quarter in Bağlar District, where no curfew was declared, and Muhammet Aktagan (27) was severly wounded by opened fire. On December 18, 2015 (13-boy) and 2 unidentified women were wounded by the opened fire of security forces in alleys. On December 22, 2015 people gathered in Diyarbakır city center to protest the ongoing curfew in Sur District and Şiyar Baran (13) was shot to death through his chest by the opened fire of security forces in Seyrantepe quarter. On December 22, 2015 K. (10-boy) through his leg and F.N. (16-boy) through his abdomen were severly wounded by the opened fire of security forces during the same protest. It is known that the health condition of F.N. was critical and he was taken into operation. On December 22, 2015 Serhat Doğan (19) was shot to death by security forces in Hasırlı quarter of Sur district. On December 23, 2015 Mesut Seviktek was shot to death by security forces in Hasırlı quarter of Sur district. On December 23, 2015 Salih Baygın (70) who has asthma and lives alone in his home on Melik Ahmet Street lost his life by suffocating due to a teargas bomb which came through his window during interference of security forces to the protesters. In Dargeçit District of Mardin (28,621 people resides according to 2014 population census) curfew was declared 1 time, between 10-13 October 2015 and 1 child lost her life. The 2nd curfew was declared on 11 December 2015 at 6pm and is still going on today. On December 13, 2015 Takyedin Oral was shot to death by security forces in Safa quarter. On the morning of December 14, 2015A. (16-boy) was severly wounded by the opened fire of security forces and people couldn’t take him to hospital for 10 hours. Hatice Gezginci (45) and Sacide Gezginci (26) who tried to carry him to hospital were wounded also by the opened fire. Later, Sacide Gezginci’s left arm got amputated. On December 18, 2015 Abdullah İş (65) was wounded by opened fire of security forces. On December 19, 2015 Ç. (15-boy) was wounded by his foot by the opened fire of security forces. On December 23, 2015 T. (12-boy) who was playing in front of his house was wounded by the opened fire of security forces. On December 23, 2015 security forces opened fire to a house in Safa quarter. Necim Kılıç(67) and his daughter Sabahat Kılıç (28) were shot to death in the house, other 3 family members were wounded. In Nusaybin District of Mardin (116,068 people resides according to 2014 population census) curfews were declared for 5 times before and longest of these continued for 14 days, 18 civilians lost their lives (2 women, 1 child). On 14 December 2015, a 6th curfew was declared at 9 am, continued for 4 days, and was lifted on 18 December 2015 at 9am for only 7 hours. And, same day at 4pm curfew was declared again fort he 7th time and that one was lifted on 24 December 2015 at 10am, after 6 more days. On December 16, 2015 Hüseyin Ahmet (22) was shot to death during clashes. And İ.B. (12-boy) was wounded by his foot during the same operation. On December 20, 2015 Emire Gök (39) was shot to death by security forces in Gırnavas quarter where no curfew was declared. On December 22, 2015 Medeni Orak (45) and an unidentified person lost their lives in Fırat quarter due to loss of blood after they were shot by the security forces and the ambulances were blocked for 4 hours. On December 22, 2015 T. (12-boy), who was playing in front of his house in Devrim quarter was wounded by his leg by the opened fire of security forces. On December 22, 2015 Ömer Aydın (65) was shot by his hand in Fırat quarter. In Silopi District of Şırnak (121,11 people resides according to 2014 population census) curfew was declared 1 time between 7-9 October 2015. On 14 December 2015, a 2nd curfew was declared at 11pm and is still going on today. On December 16, 2015 the house that Hüseyin Güzel (70) was living in Başak quarter was hit by a missile and he lost his life due to heart attack caused by the fear. On December 16, 2015 Hacı Yusuf (60) was wounded by the opened fire of security forces in Başak and Barbaros quarters. On December 17, 2015 Yusuf Abi (80) lost his life due to heart attack caused by the opened fire to his house in Barbaros quarter. On December 18, 2015 Reşit Eren (17) and Axin Kanat (16) lost their lives by trapping in the wreckage of the house they live in Nuh quarter, when it was shot by a missile. On December 19, 2015 İbrahim Bilgin (18) was shot to death by security forces in Yeşiltepe quarter. On December 19, 2015 Şiyar Özbek (25) in Nuh quarter and Süleyman Çoban (70) in Başak quarter were shot to death by security forces. On December 19, 2015 Mahmut Erdoğan (50) was wounded by his foot by the hitting missile on his house in Barbaros quarter. On December 20, 2015 Egit Kaçar (22) who has mental disability was wounded by the opened fire of security forces in Başak quarter. On December 20, 2015 Ayşe Buruntekin (40) was shot to death on the rooftop of her house in Cudi quarter by the security forces. On December 21, 2015 Mehmet Mete Kutluk (11) lost his life by hitting by a missile on his house in Karşıyaka quarter. On December 21, 2015 Ömer Sayan (70) was shot to death by the opened fire of security forces in Nuh quarter when he was going to the toilet which was in his yard. On December 21, 2015 it was heard that Yusuf Nas (55) was wounded by the opened fire of security forces in Karşıyaka quarter when he was trying to reach his brother’s house to put out the fire that started by a missile. On December 22, 2015 Mahmut Oruç (28) was shot through his chest, Cindi Algur (45) through his back and Halit, whose surname could not be confirmed, was shot by his foot in Nuh quarter. In Cizre District of Şırnak (132,857 people resides according to 2014 population census) curfews were declared for 4 times before and longest of these continued for 8 days, 23 civilians lost their lives (7 children, 4 women). On 14 December 2015, 5th curfew was declared at 11pm and is still going on today. On December 15, 2015 E. (15) who was trying to reach Konak quarter was shot in the head on Yafes Street and is still in intensive care unit. On December 15, 2015 T. (15) was wounded by his head by the opened fire of security forces in Cudi quarter when everyone was making noise protests against curfew from their houses. On December 16, 2015 Mevlüt Şimşek (21) was wounded by his hip by the opened fire of security forces when he went to the water tank on the rooftop of his house in Cudi quarter. On December 16, 2015 Hediye Şen (30) was shot to death in her yard in Cudi quarter by the opened fire of security forces. On December 17, 2015 Doğan Aslan (24) was shot to death through his back by the opened fire in Cudi quarter. On December 17, 2015 Osman Emcür (75) was severly wounded by opened fire of security forces in Cudi quarter and ambulance was not allowed to the quarter. On December 17, 2015 Y. (14-boy) was wounded by the opened fire in Yafes quarter. On December 18, 2015 (11-boy) was wounded by his foot by the opened fire of security forces while he was playing in his home’s yard in Cudi quarter. On December 18, 2015 municipal employee İrfan Uysal (29) was wounded by the opened fire of security forces and it’s heard that his left arm was amputated. On December 18, 2015 İbrahim Akan (15) lost his life when his house was hit by a missile in Sur quarter. (child) whose surname couldn’t be confirmed and Kadir Çömlek (21) was wounded in the same house. On December 19, 2015 Selahattin Bozkurt (70) was shot to death by security forces in Cudi quarter during an operation. On December 19, 2015 Post Office(PTT) vehicle driver Yılmaz Erz (42) was shot to death in Yafes quarter. On December 19, 2015 Lütfü Aksoy (25) was severly wounded by the missiles in Cudi quarter. Aksoy lost his life on 23 December 2015 in hospital. On December 20, 2015, Zeynep Yılmaz (40) was shot to death by security forces during an operation in Cudi quarter. The baby S. (1-boy) was also shot through his back during this operation of security forces. On December 20, 2015 7 months pregnant Güler Yanalak (32) was shot by her womb by the security forces in Nur quarter. Yanalak was taken to intensive care unit but the baby was dead. On December 20, 2015 Hediye Çete (35) was wounded through her chest by the opened fire, in her home’s yard in Cudi quarter. On December 20, 2015 T. (17-young woman) was wounded by her arm in Cudi quarter by the opened fire. It’s heard that she wasn’t allowed to be taken to a hospital by the security forces. On December 21, 2015 Cahide Çıkal (35) was shot to death by the opened fire of security forces to the houses and alleys. On December 22, 2015 Doğan İşçi/İşi (32) lost his life by the hitting missile on his house. And Mehmet Tekin (35) was shot to death by police. On December 22, 2015 Mehmet Saçan (38) was shot to death by his head by security forces in Cudi quarter. On December 22, 2015 Emine Duman (75) lost her life due to heart attack caused by the fear of a missile that hit very closely to her house. On December 23, 2015 Azime Aşan (59) was shot to death by snipers in Nur quarter. On December 23, 2015 Dikran Sayaca was shot to death by opened fire of security forces in Sur quarter. On the night of December 22, 2015 Adile Karaduman (55) was wounded by the opened fire of police in front of her house in Cudi quarter. On December 24, 2015 Ferdi Kalkan (20) lost his life in his home when it was hit by a missile in Cudi quarter. On December 24, 2015 Abdulmecit Yanık (27) and Hacı Özdal was shot to death by the opened fire of security forces in Yafes quarter.